Holding a masters degree in physics, Robert Arthur Stayton has taught college courses in physics, energy, and solar energy at the University of California Santa Cruz and Cabrillo College. He also earned a Graduate Certificate in Science Communications from UC Santa Cruz. In 1997, Stayton and his wife built a solar home in Santa Cruz County and outfitted it with an off-grid solar photovoltaic (PV) system. He has been living with solar energy since then, always looking for new ways to apply solar in his daily life. He drives a solar-charged Plug-in Prius, heats his water with a solar water heating system, and bakes his bread in his solar oven. He has served as host to hundreds of people who have toured his home to see his solar efforts. Power Shift: From Fossil Energy to Dynamic Solar Power by Robert Arthur Stayton is a very relevant book in today’s world. Power Shift presents a historical perspective on traditional energy sources and the use of fossil fuels and carbons and their effects. It talks about how our ancestors used energy as well as some of the newer sources such as nuclear, solar, wind, etc. The book then discusses the various ways in which we can harness solar energy, which is not only an unlimited source of energy, but is clean and environment-friendly as well. Power Shift also talks about the challenges facing us as we struggle to discover and harness new energy sources in a way that is long-term and sustainable. Included in the book are real-life practical tips and ideas on ways to use solar energy and apply it in everyday use. 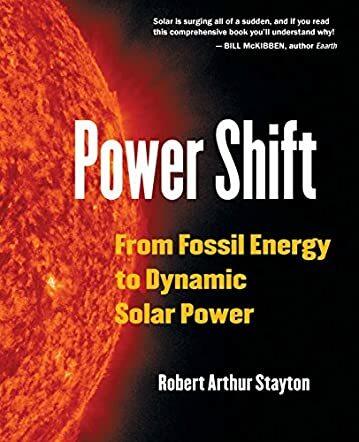 Power Shift: From Fossil Energy to Dynamic Solar Power by Robert Arthur Stayton is an extremely useful and well-written book. Although solar energy has been around for a while, Power Shift truly makes a great case for why it is the solution of the future, along with great practical ideas on ways in which to harness it. I liked the detailed diagrams and descriptions of how to put solar power to use in the form of solar panels, etc. The writing is clear, to-the-point, and it is obvious that Robert Stayton knows what he is talking about and is extremely knowledgeable in his field. All in all, a great, useful read for everyone as we move forward towards new, renewable, clean energy sources. Here are some additional reviews. More can be found at http://sandstonepublishing.com. In this bright treatise, Stayton outlines how humanity might transition from finite, carbon-dioxide–emitting fossil fuels to permanent, pollution-free solar power by the end of this century. … He expertly blends scientific research, historical context, personal experience, and visionary thinking in this book and relates it all in plain language. He has a gift for demystifying things, from horsepower and steam engines to gigawatts and thorium reactors. … An energy book that’s a pleasure to read and sure to win new solar converts. Fifteen years in the making, Stayton’s book delivers an excellent primer on how to shift from fossil fuel to solar power. It will do for the energy chain what The Omnivore’s Dilemma did for the food chain and much more. Stayton’s book is a forty-five–year blueprint for total solar dependence. This physicist and teacher begins at the dawn of man and rolls smoothly through the history of how we became energy-consuming animals and adapted well to each energy shift, from fire to water, coal, steam, and oil. Eloquently, Stayton persuades that our current swing from fossil fuel to solar power can also remain gradual and non-traumatic. RECOMMENDED.